I love this website. It’s all one big hilarious laugh to me. It was never intended to be anything more than eating burgers with my friends and telling some silly stories. The fact that I get invited out to eat burgers, meet people and get to be on TV is a total gas. I joke all the time, and it comes more true everyday, I am becoming more and more Burger Famous. But hey, my gain is your gain! I eat a burger and tell you if it’s worth your time or not. Once in awhile I get treated to something special that I get to pass it along to my fellow burgers eaters. I got an email this week from a representative from Drive-Thru burger chain Sonic Drive-In. Rather than paraphrase, I’ll give it to you just like it came to me. Tailgating before a football game is an All-American tradition. SONIC is proud to introduce the bold Western Chili and Spicy Southwest Loaded Burgers to make any game day experience complete. These hearty, 100% pure beef burgers come loaded with toppings like crisp bacon, warm chili, crispy batter dipped jalapeño strips, fresh tomato and a perfectly sized bun. 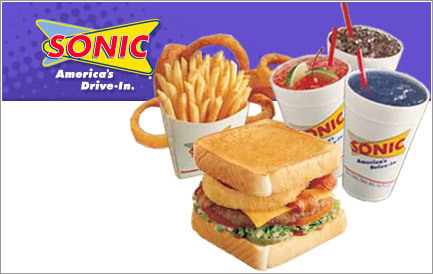 We’d like to send you a $100 MySONIC gift card and an exclusive SONIC tailgate blanket so you can treat your fellow football fans to delicious pre-game fare at SONIC Drive-In. In accordance with FTC guidelines and in the spirit of the Blog With Integrity pledge we encourage the bloggers we work with to fully disclose that the products they are reviewing and/or giving away were provided to them at no charge by SONIC Drive-In. It is a damn nice official Sonic Drive-In genuine pro-weave sweatshirt blanket and a $100 gift card to any Sonic Drive-In. Looks like its time for me to rent a car and head out to 1 of their 5 locations in New Jersey! So here’s the deal. I’ll give two readers a little taste of Burger Fame but you gotta do something in return. “Like” Burger Conquest on facebook and make a wall post on the page telling me how much you love Burger Conquest.I will pick the 2 most creative posts to win the 2 prizes listed above. You can score and automatic TRUMP VICTORY of either prize if you promise to pick me up and drive me out to a Sonic Drive-In. You can bring as many friends as you want and we can spend up to the entire amount of the card. Winners will be chose on Tuesday, October 5th at 6 pm EST. This entry was posted in Uncategorized and tagged the great burger conquest hamburger cheese french fries sonic drive-in tailgates loaded burgers free stuff. Bookmark the permalink.